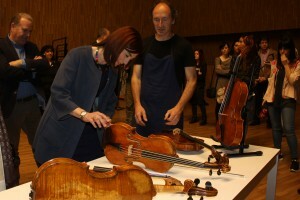 Throgh a program designed by the Department for Education, Language Policy and Culture of the Basque Government, BELE, Basque Violin Making School, will lend the instruments built by them to music students from the Conservatoires within the Basque Country. For next 2017-18 academic year there will be 34 instruments, 15 violin, 15 viola and 4 celli availiable. Here some photos of the students choosing their temporary instruments for year 2017-18.